This Homemade Dry Cured Duck Prosciutto is an interesting spin on traditional prosciutto that can be easily made at home with only a few simple ingredients. No special equipment required! This is probably the last meat recipe you’ll see me post in a while… I’m not saying that I’m not going to do meat ever again, but I’m planning on staying away from it for a wee bit. In fact, I’ve decided to start the year with a 30 day vegan challenge, so there will be no animal products in my diet for at least this one month. And then I’ll see where that takes me. But I get the feeling that meat will become more of an occasional thing for me. At least, that’s the plan. But for now, let me tell you about this beautiful thing that I learned about just shortly before the Holidays and then elected to serve as part of my New Year’s appetizers. Very similar to prosciutto, this dry cured duck is made with just a couple of duck breasts, some coarse salt, coarse ground black pepper and a few sprigs of fresh herbs. That’s it. It’s super easy to make and will not fail to please, and impress, your family and loved ones! The only thing is you need to plan on making it quite a while in advance, as it will need to cure for up to a full day, and then age/dry for up to 3 weeks! But don’t let that stop you. The prep work itself is super easy and will only require a few minutes of your time. 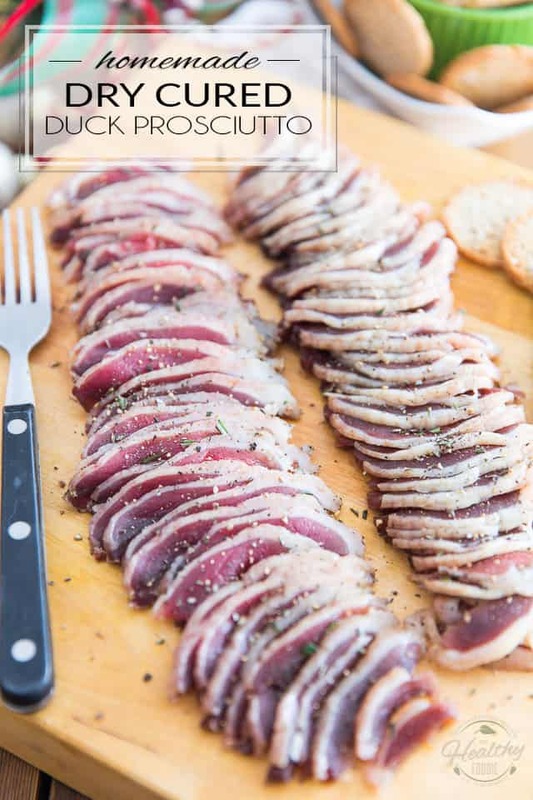 If you’re a fan of prosciutto, you will love these dry cured duck breasts. Only this time, you will be the artisan behind this delicious creation! The post Homemade Dry Cured Duck Prosciutto appeared first on The Healthy Foodie.